At the edge of the forest stood a large squat toadstool. Next to him grew a spindly plant about the same height with four leaves. “A year!” shouted the toadstool, “Who has got that kind of time! A whole year growing something that you can’t even see! Roots may be handy, but that’s the silliest waste of time I ever heard.” And he laughed and laughed. A deep religious faith is like the deep roots of the oak tree. It helps to give us strength to weather the storms of life. Engaging in Multigenerational Multiculturalism requires that we cultivate our roots so that as the ground shakes and we sway, there is still something to which we can hold on. Where do we start? For some of us, identity is an intensely personal piece of the puzzle that makes up who we are. It is the badge we carry on our sleeves and with our bodies and can not put down. For some of us we have not yet had to think about how we would identify ourselves and our bodies. We have had the privilege of moving through life “fitting in” with the dominant paradigms. For some of us, our identities are defined with labels that others have put upon us; described by words we would not have chosen but have learned to embrace and make our own. Regardless of what our personal identities are, we all know that navigating the maze of identity labeling can be difficult. What do you call me? What do I call you? Which word or words do I use so that I honor all of who you are? How will I know when I’ve stumbled upon the correct terminology? Will I offend you if I don’t always get it right? Why does language matter so much? Where can I buy the Official Handbook of Identity Terminology? Words matter. Many of us have labels that do not do justice to our true identities. The words give us power – the power to name ourselves and our own identity. This is important. Too often that power is taken away from the oppressed. Too often identity goes unnamed and individuals are left feeling isolated and without community. As a child, it never occurred to me that I wouldn’t grow up to be the guy that I am today. I’ve known my gender since I was in kindergarten, but back then, and as I was growing up, I never heard the word “transgender.” I saw no reflections of myself in mainstream media or elsewhere in my life. I struggled with how to describe what I knew inside was a truth: my gender wasn’t like the two options everyone else fit into. And because I had no language to describe what I knew, I felt very isolated and alone. I had nowhere to go and no one to talk to. It was over a decade later that I learned about the multiplicity of gender and the importance of labels. The words we use to label our identities are sometimes more important than the very identity itself. Language can give us power. It can give us the opportunity to name ourselves and find others like us. But the label is not the end of the journey. In the time since I was in kindergarten my gender and sexual orientation have been labeled: Girl, Woman, Lesbian, Transgender, Transgender Lesbian, Straight Man, Transgender guy, Bisexual, Queer, and Other. They are but some of the many labels; identities I have been in my lifetime. Alone, none of them adequately describe me. Together, with the labels that define my race, ability, class, and other aspects of whom I am; together they offer a glimpse of who I was at a particular moment in time. This multiplicity of my identity offers a snapshot of who I was, who I am, and who I am becoming. My identity does not exist in isolation, because few of us exist in isolation. We seek out communities of people like ourselves, and in those communities we find common language to name ourselves. What I call you and what you call me is not only about the words – the labels, it is also about the relationship between who I am and who you are and who we are together. Where do we start? Eli Clare reminds us that “There are a million ways to start, but how do [we] reach beneath the skin?” We can reach beneath the skin by telling our stories and learning each others’ stories. We can pay attention to the words we use. And we can create common language together. It is important to start any conversation about multiculturalism by understanding and more importantly, acknowledging our own identities and social locations because it is never possible to fully remove them from our perceptions and experiences. So we must be aware of them, knowing that some influence our understanding of our experiences in the world, some grant us more privilege than others, and some cause us more difficulty than others. Howard Thurman writes in his book The Search for Common Ground, “I have always wanted to be me without making it difficult for you to be you.” Much as I like the sentiment behind Thurman’s comments, I’m not sure it is possible. I know that as I have become clearer and more open about my own identities, I have made it difficult for others to be themselves. And likewise, the more I have learned about other identities, the more I am aware of privileges I am granted, privileges which sometimes I need to be willing to give up to in order to help bring about the complicated world I desire. The world Deane referred to last night – The world where Paradise is here and now. So where do we start? We start by recognizing who we each are… by sharing our identities and social locations as individuals and learning one another’s passions. I am an “out” transgender queer guy of mixed race, complicated family dynamics, and a life-long Unitarian Universalist. I live with learning disabilities and a deteriorating body. I live in a physical world and society that constantly reminds me that if I am to survive it will be at my own effort, for the world on its own is not moving fast enough to embrace my fullness. While my particularities may be unique to me, I am not alone in my location; you are not alone in your location. Unitarian Universalism teaches us that relationship is at the core of connections. Our faith teaches us that learning to understand and affirm the differences between us will enhance our relationships. But this is not easily done, particularly when the present understanding of difference “defines it as absolute otherness, mutual exclusion, categorical opposition.” Such an understanding leads to a conceptualization of those who are different as outsiders, with those belonging to the dominant group having the power to decide what is normative (themselves) and what is deviant (others). As long as this continues to be the prevalent understanding, there is no possibility of having just personal relationships or of creating just societal structures that will not benefit some groups at the expense of others. Thus it becomes doubly important that when we engage in relationships with people whose lived experience is different from our own, we are careful to do so in ways that do not further this act of “other-izing.” This is particularly difficult to do when we know that personal stories are one of the best ways for people to understand oppression and privilege. For those of us that benefit form society’s favor and privileges, we are often not aware of the existence of certain types of ‘otherness,’ which in turn suggests that we may not be aware of that aspect of our own identity. This is ok as long as we are willing to be open to learning new things about ourselves, knowing that our process of learning may be uncomfortable for all involved. For example, my friend Jane is of European-American descent and shared with me that it was not until she began to do anti-racism work that she was even aware of her own “whiteness.” Like us, Jane lives in a society that favors Euro-centric ethnicities over other ethnicities. Before engaging in anti-racism work and because her ethnicity placed her in the dominant group, she never had to become aware of this aspect of her identity. As a result, her encounters with People of Color prior to doing anti-racism work both ignored and minimized the whole person and prohibited her from having “just personal relationships.” Conversely, those she was encountering likewise were prohibited from having “just relationships” with her. In Jane’s anti-racism work, she attended a training where a small group of People of [some] Color[s] sat in front of the training group and shared their experiences living life where they were not of the dominant ethnicity and/or race. It was in hearing of the pain, suffering and unfair injustices each person had experienced based on their skin color, ethnicity and race that moved Jane towards beginning to analyze the structures of racism and White-Supremacy found within the United States of America. Jane needed to hear of the pain and suffering the ‘other’ had experienced before she could acknowledge her own privilege and contribution to that pain and suffering. For her, it was a necessity in the equation towards a true encounter with the ‘other.’ And that makes sense – many of us here today have probably had similar experiences. Accountable relationships require that we also understand the other side of the equation. We need to consider what the ‘other’s’ encounter with us is like. Transgender artist and photographer, Aiden writes “When you’re gay it can be scary to hold hands in public, but there is an understanding of the gay community. I’m trans and it makes people uncomfortable in a whole other way. It’s different than being thought of as a tomboy or lesbian; people look at me and they aren’t sure what I am. They stare and point and whisper. This awareness of one’s body and “transness” becomes more tangible in moments of physical need, such as the use of public bathrooms. While Tremain discusses normalcy from a disabled queer person’s perspective, the experience of being expected to be or act ‘normal’ is familiar to most people in historically marginalized groups. We must consider the impact of and on thea/ologies that expect any people to conform to a concept of normalcy in order to be respected and welcomed in religious community. Historically, religions have been used to create and reinforce the very boxes that limit a person’s possibility. At its core, any and all religion can (and should) be used to provide a wealth of possibility for becoming. To depict the holy as something in motion and not as a fixed entity is of importance in this work. Process theology lends itself nicely to this piece of the conversation, providing room for the holy to exist as events constantly in motion, with infinite possibilities yet to become. When considered as such, divinity can then be found in the differences between people rather than within the sameness. The biological, physical, and metaphysical world teaches us that life is pluralistic. From micro-organisms through to the stars and beyond, difference is in abundance. The boundaries that separate these differences are porous, not closed. Do you know Edwin Markim’s poem? “Heretic, Rebel a thing to flout; he drew a circle that shut me out. But love and I had the wit to win, we drew a circle that took him in.” In a sense it is like an amoeba, broadening the boundaries to encompass all that is around us, but different in that unlike the amoeba which absorbs and assimilates everything else, this new organism allows for each of the cells to remain individual and connected. It’s as if we are creating a whole new being. Yet we mere humans continue to attempt to treat the differences between us as threats to fixed boundaries rather than as examples of the holy. “When an individual occup(ies) a space that transgresses borders [boundaries], [we feel] challenged and when [we] feel challenged, [WE] GET UNCOMFORTABLE and [blame the transgressor] because, of course, the only goal in [the individual’s life] is to MAKE [US] FEEL UNCOMFORTABLE! The burden of imagination is put on those individuals who transgress the boundaries (those ‘others’) because these boundary crossers are already in the uncomfortable role of bringing the unimagined into being. In order to both survive and thrive, a new world must be imagined. Our Unitarian Universalist faith teaches that all things in this life are connected, not just to each other but also to what was, what is, what is becoming, and what could have been. Religion’s role is to provide places where “otherness” can be appreciated and affirmed for all that it is, without a need to conform or assimilate to a dominant societal view. Religion’s role is to defend the porous boundaries, not so that the boundaries become firm but so that the porous quality of those boundaries is always mushy and moving. Religion’s role is to imagine and bring forth a new world that embraces the messiness and mixidy of life. A world that acknowledges that each one of us has something to offer and together the puzzle will make sense. The elephant was in a dark house; some Hindus had brought it for exhibition. In order to see it, many people were going, every one, into that darkness. As seeing it with the eye was impossible, [each one] was feeling it in the dark with the palm of his hand. Similarly, whenever anyone heard [a description of the elephant]. he understood [it only in respect of] the part that he had touched. If there had been a candle in each one’s hand, the difference would have gone out of their words. In Rumi’s rendition of the story, each person is invited to sit together at the end of the tour and share hir experiences and observations. He points out that only through this sharing can “The Truth” be found. We learn not only by asking questions, but also by observing what is happening around us. As a child and young teen I often accompanied my parents to congregational meetings at the First Parish in Framingham, where I have been a member for almost 40 years. One of my favorite experiences was attending the annual meeting. Every year up until a few years ago the members of the congregation debated the same issue at each meeting – whether to take an offering during worship services. Both sides of the debate had valid points: One side believing that passing the collection plates allowed the gathered worshippers to make a token donation thus keeping the connection between finances and spirituality tangible and visible. The other side believing that to pass the collection plates during worship gave members the false impression that what was put in the collection plate would be enough to financially sustain the congregation. I loved that this agenda item was proposed from the floor of the annual meeting under the last article on the meeting warrant, the “any other business” article, keeping in practice the ability and right of the congregation’s membership to propose business alongside the elected leadership. I also loved this issue because while on the night of the meeting it divided meeting participants into sides, these sides never lasted longer than the meeting. Through my observation (and eventual participation) in these annual meetings I learned the importance of keeping community even in the midst of disagreement. One of the important lessons I have learned growing up as a Unitarian Universalist is the power of community, particularly as it applies to a learning community. It is one thing to read and reflect on an experience or idea, but to do so engaged in conversation and study with other members of the congregation can be a powerful experience. By learning together we challenge one another to think outside the box and at the same time hold a mirror of faith to one another as a reminder of our individual and collective values. We learn together how best to live out our faith, not just on Sunday mornings but all week long. I have been practicing our faith my whole life. This I can say for certain: Our faith is not an easy one to practice! It demands of us that we be in constant awareness and dialogue with the world. Unitarian Universalism requires religious engagement, not just when it is convenient or easy, but in every moment. One of the greatest strengths Unitarian Universalist thea/olgies offers is an image of life that is in motion and pluralistic. Through our focus on community and covenant, we learn that the holy takes place in our connections to and with one another. Participation in religious community should help each of us to answer life’s questions. It should teach us holy engagement not only on holidays and at social justice rallies, but also in everyday life. It should challenge us to become better people and provide us with the tools to live out our religious values. It should help us to clearly define and articulate what we individually and collectively believe about life’s deepest (and not so deep) questions. The Sufi traveler reminds us that sometimes we need to approach each activity as a learning/teaching opportunity. We learn through asking questions and finding answers. We learn through engagement with materials presented to us. We learn through observation of what is happening around us. And we learn by noticing what is not happening around us. Therefore, everything that happens in congregational life is part of a multigenerational religious education curriculum. Harris’ theory that it takes all aspects of church life to complete the curriculum of religious education makes sense to me. Within the children’s religious education program there is not enough time to teach all that needs to be taught. Let us pretend for a moment that each child in the congregation of East Cupcake was going to be present for every class – their annual classroom instruction (not including special activities for holidays, school vacations, etc. ), would amount to approximately 24 hours of religious instruction. In one year’s worth of living they will have spent 1 day engaged in formal religious education. That’s just not enough time to teach everything we want to teach them! And we adults spend even less time (if any at all) in classroom-based religious instruction. But by using Harris’ framework for what makes the curriculum we can note that we are teaching and learning through all that we do. Our use of fair trade coffees and teas, our commitment to lessen our impact on the environment and our work with communities outside our doors keeps our focus not only on ourselves but on the rest of the world as well. These are important aspects of our curriculum of outreach. I would like to add an additional component to the curriculum Harris refers to – that which happens in the family. Religious education happens when we share our thoughts and questions with family and friends. It happens when we engage in the world and reflect on those experiences. It is my hope that our religious education programs provide us all with the tools needed to make sense out of our everyday lives. Religious education does not happen solely in the church building, but also at home and at hockey practice, it happens during music rehearsals and while running errands. It happens at the dinner table and while watching television. The Reverend A. Powell Davies wrote, “Religion is not something separate and apart from ordinary life. It is life – life of every kind viewed from the standpoint of meaning and purpose: life lived in the fuller awareness of its human quality and spiritual significance.” I hope that at its core, Religious Education teaches this message of the inextricable connection between religion and life. I hope that through religious education we cultivate our roots in order to better bend and sway to the changing times. Sofia Lyon Fahs, who served as the American Unitarian Association’s National Director of Religious Education in the late 1930s through to the 1950’s and who is often considered the grandmother of Unitarian Universalist Religious Education, focused on incorporating experiential learning into religious education programs as well as tried to keep us focused on recognizing the spiritual needs of our children. While her writings often mention only children, her ideas are applicable to all of us regardless of age. In her book, Today’s Children and Yesterday’s Heritage, first published in 1952 she writes, “Instead of helping children to think about ‘religious things’, we need to learn how to help children to think about ordinary things until insights and feelings are found which have a religious quality. And what is this religious quality or way of studying? While Fahs directs her writing to the needs of children I offer that the need to think about ordinary things in such a way that they touch our hearts is not age-specific. Engaging in the practice of thinking so deeply about something that we feel it – this is religious work. Learning the tools with which to do such engagement is Religious Education for the Soul. It is at the heart of why we gather in religious community, regardless of our age, and can be the common ground from which we grow our multigenerational multicultural efforts. What they don’t understand about birthdays and what they never tell you is that when you’re eleven, you’re also ten, and nine, and eight, and seven, and six, and five, and four, and three, and two and one. And when you wake up on your eleventh birthday you expect to feel eleven, but you don’t. You open your eyes and everything’s just like yesterday, only it’s today. And you don’t feel eleven at all. You feel like you’re still ten. And you are—underneath the year that makes you eleven. Like some days you might say something stupid and that’s the part of you that’s still ten. Or maybe some days you might need to sit on your mother’s lap because you’re scared, and that’s the part of you that’s five. And maybe one day when you’re all grown up maybe you will need to cry like you’re three, and that’s okay. That’s what I tell Mama when she’s sad and needs to cry. Maybe she’s feeling three. Because the way you grow old is kind of like an onion or like the rings inside a tree trunk or like my little wooden dolls that fit one inside the other, each year inside the next. That’s how being eleven years old is. You don’t feel eleven. Not right away. It takes a few days, weeks even, sometimes even months before you say Eleven when they ask you. And you don’t feel smart eleven, not until you’re almost twelve. That’s the way it is. connections made across the generations and ages. Groups of people made up of many generations, many ages – working together for a common cause or purpose. But more than working together, multigenerational means that we are being intentional about honoring each of the generations and are making space for those not already present. This might mean changing the time we hold meetings or classes or social events so that those who don’t drive at night and those who go to bed early can both be with us. It might mean that we older adults intentionally invite the youth to join us, or that we remember to advertise our events through Facebook and Twitter. It might mean that worship becomes more interactive, uses multimedia and different music, or meets at a different time. It might mean that sometimes we are uncomfortable with how things are being done, but because we are in community we trust that sometimes we will also be as comfortable as we need. what exactly do we mean by multiculturalsim? There is no good definition of it. Some would say that it is to honor and celebrate a multiplicity of cultures and identities. I would offer you that while this is true, I think that it is an action – it is a way of being in the world; living with an openness to new things and the messy complexity of life. I suspect that Multigenerational Multiculturalism is already happening in your congregation. Our children’s and youth religious education programs tend to be hotbeds of multicultural activity. The foundation of what most of our congregations teach is not necessarily found in the curricula used every week, it is found in the ethos of the programs. This is in part because the bodies that make up our children and youth religious education programs is often more ethnically and racially diverse than the adult make-up of the congregation. It is also because we are teaching our children from the earliest ages that it is important to recognize each other’s differences and to honor those differences. But there is more that we can do in their programs and throughout the curriculum of the church. Creating this multicultural ethos means that we are making space for multiple learning styles and physical abilities. It means making sure that our buildings and meeting sites are physically accessible and affordable. It might mean that we pool our collective financial resources together to ensure that who might not otherwise be able, are able to represent our congregations at General Assembly and other such events. Being a multicultural community means that we are learning about people and communities around the globe and honoring the dates important to them, particularly when members of those communities are part of our church community. I ask the teachers in my program to begin with the assumption that diversity is present in the room, whether they recognize it or not. I ask that instead of relegating one session a year to a “diversity” session, we make sure that the stories that we choose and the language that we use models the multiculturalism that we hope will be present. This sometimes means changing the relationships of people in the stories in order to reflect multiple sexual orientations. This sometimes means assuming more than two genders, that we make room for a multiplicity of gender identities. 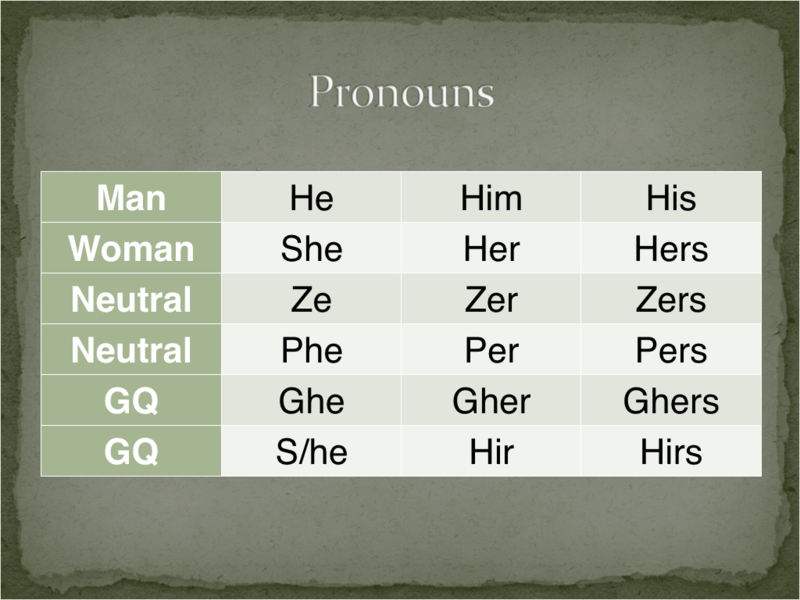 This sometimes means using pronouns that are not “he” and “she” … using pronouns such as “ze” and “gher.” I challenge my teachers and myself to always use “ze” and “gher” or other non-traditionally used pronouns whenever the gender or the character is not important to the story. This takes work and intentionality, but it is worth it. I invite my volunteer teachers to continue these practices even after they’ve finished teaching. I challenge them (and today I challenge you) to continue these practices in their daily lives. I also encourage them to stretch themselves to be aware of the places in their lives where they have privilege and power – inviting them to use their power to help shape the world toward justice. Being a multigenerational multicultural community also means that we are willing to make mistakes and are willing to be called to task on our mistakes. It means that we are willing to accept that when we or others make mistakes it is despite best efforts and good intentions and thus we must be willing to be gentle and forgive one another. It means that we give one another permission to fail and permission to pause when the going gets rough; trusting and nudging each other back on the path after a spell. It means being willing to take risks and catch one another; remembering that we are never in this alone! It also means that at times we must be willing to return to past choices and reconsider our decisions. And with that in mind I ask you to join me in holding the Thomas Jefferson District Assembly in your hearts and prayers today as they meet to reconsider changing their district name to the Southeast District. The impetus for this reconsideration of the name was a challenge brought by people of color and white allies at the 1993 General Assembly at which was scheduled a Thomas Jefferson Ball. GA participants were encouraged to attend this ball dressed in costumes of the period. African Americans asked the Assembly to consider what they should wear, suggesting perhaps “rags and chains.” In 1996 the district board began a serious discussion about how the name disenfranchises some Unitarian Universalists, especially those of African descent, Native American, and women. They began a two-year period of study that culminated in a vote at the 1997 District’s Annual Meeting in Charlotte. The motion to change the name was supported by the majority of delegates present (achieving a simple majority) but because of the two-thirds super majority required for passage, the motion failed by a slim margin. After the vote, a second proposal was made that asked the board to bring the name change amendment back for reconsideration in five years. That motion carried and went to vote last year, again achieving a simple majority but not the required super majority. Five congregations in their district petitioned to have the discussion and vote placed on this year’s agenda and at 3.45p this afternoon they will begin that piece of their agenda – may their deliberations be fruitful and may they know that they are not alone. May we all know that we are not alone; indeed only by working together can we bring about the multigenerational multicultural that “Mmm… Goodness!” that this hurting world so desperately needs. May it be so; and may we be the ones to make it so. Clare, Eli, Exile and Pride (South End Press: Cambridge 1999) 123. Thurman, Howard. The Search for Common Ground. (Richmond, IA: 1971), xiii. Young, Iris Marion, Justice and the Politics of Difference (Princeton: Princeton University Press, 1990) 169. Cromwell, Jason, Queering the Binaries: Transsituated Identities (Urbana and Chicago: University of Illinois Press 1999) 128. Tremain, Shelley, Pushing the Limits: Disabled Dykes Produce Culture (Women’s Press 1996) 15. Keller, Catherine and Anne Daniell, editors, Process and difference: between cosmological and poststructuralist postmodernisms (Albany: State University of New York Press 2002) 132. Unpublished email exchange between author and Ibrahim Farajajé, 7 December 2005. Mitchem, Stephanie. “Womanist & Unfinished Constructions of Salvation” Journal of Feminist Studies in Religion. 2001: 99. Harris, Maria. Fashion Me a People. (Louisville: Westminster John Knox Press 1989) 63-64. 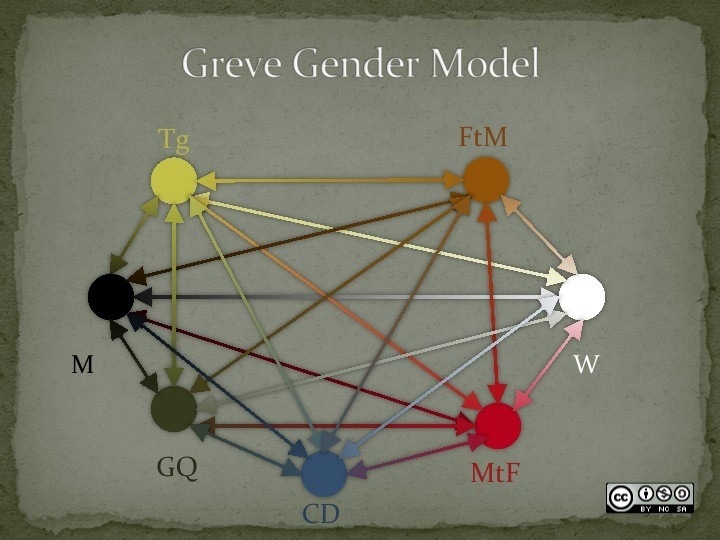 This model does not include all possible genders – it was created to suggest that the multitude of genders often placed under a transgender umbrella exist outside/off the man/woman dichotomy.